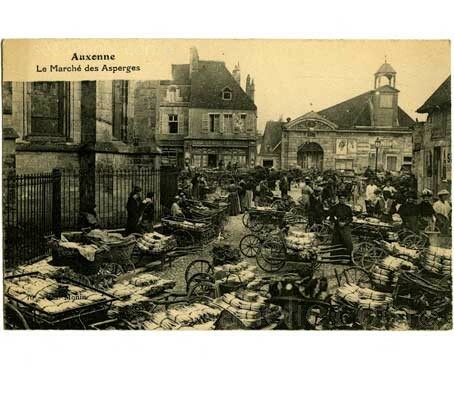 Asparagus has grown in the wild in France since the time of Louis XIV. Originally only three different types were available, they were distinguished mostly by their thickness, ‘la grosse’, ‘la commune’ and ‘la sauvage’. Cultivation become widespread in the mid-19th century, with populations often identified according to countries and towns where they were grown. Arguably the best known asparagus was cultivated at Argenteuil, situated just 14 kilometres northwest of Paris. 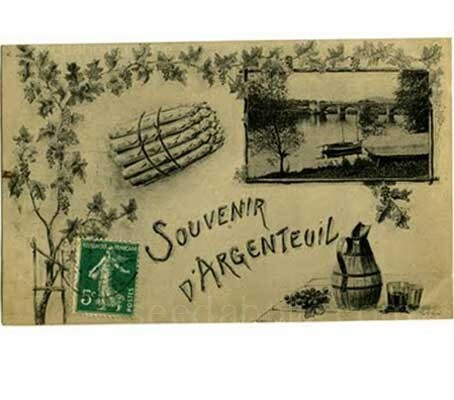 For centuries Argenteuil was an important asparagus-growing district: at one time several thousand persons were employed in cultivating the crop. Asparagus 'Precoce D'Argentuil’ or ‘Early Argenteuil‘ was listed by Vilmorin-Andrieux in 1885 as a selection from 'Giant Dutch Purple'. It is one of three subvarieties of Argenteuil (early, mid, and late) and is highly esteemed for its thick, rose-purple spears with tender tips and an excellent flavour. It is an excellent choice for the impatient gardener. Earlier and hardier than most asparagus varieties, the spears are usually produced from seed struck plants in the second year and it will shoot earlier in the season than other varieties. In France, Asparagus D'Argentuil is the traditional variety used to create the popular white asparagus by blanching the plants. White asparagus, nicknamed ‘edible ivory’ and ‘white gold’ typically sells for two to three times as much as the green-skinned variety due to the high cost of production and the short season. However, it is simply created by mounding earth over the spears as they begin to push out of the ground, thus keeping them from sunlight and the photosynthesis that would turn them green. This noble stalk may cost a king's ransom for much of the year but when cultivated in the garden it is affordable for even us commoners and is uncommonly delicious. Avoid frost pockets and exposed areas. Do not replant on an old asparagus bed as diseases may be a problem. 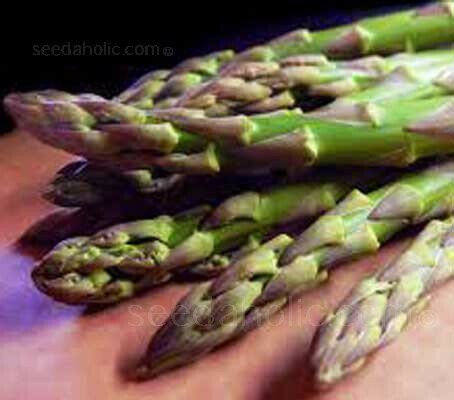 Asparagus will grow on most soil types provided they are well drained. On heavy soils consider creating raised beds, acidic soils may need liming. Soil preparation is essential. Clear the ground of weeds. On heavily compacted soils consider double-digging, otherwise cultivate to a spade’s depth, incorporating well-rotted farmyard manure. Soak the seeds in water overnight. Sow seeds singly into modules at a depth of 1.25cm (½in). They will germinate in 2 to 8 weeks depending on soil temperature. The optimum germination temperature is 20 to 28°C (60 to 85°F). After 12 to 14 weeks, they will be ready to be transplanted outdoors, do this no earlier than four weeks after the last spring frosts. Fork over the prepared area and dig a trench 30cm (12in) wide and 20cm (8in) deep. Work in well-rotted manure in the bottom, cover with 5cm (2in) of the excavated soil and make a 10cm-high (4in) ridge down the centre of the trench. Place the crowns on top, spacing them 30 to 45cm (12 to 18in) apart (right). Leave 45cm (18in) between rows and stagger the plants. Spread the roots evenly and fill in the trench, leaving the bud tips just visible. Water in and mulch with 5cm (2in) of well-rotted manure. Asparagus beds must be kept weed free - best done by hand as the shallow roots are easily damaged by hoeing. Mulching discourages weeds and retains moisture. Apply a general fertiliser in early spring and repeat once harvesting has finished. To avoid top-growth breaking off in wind and damaging the crown, use canes and twine either side of the row for support. Allow the foliage to yellow in autumn before cutting it down to 2.5cm (1in). Late frosts will cause distorted growth: protect with a double layer of fleece. Do not harvest for the first two years. In the third year, pick from mid-April for six weeks. To harvest, choose spears that are thicker than a pencil. Cut with a sharp knife 2.5cm (1in) below the soil when they are no more than 18cm (7in) tall. In warm weather, harvest every two to three days for best quality spears. The main pests to affect asparagus are slugs and snails, and the larvae and adults of the asparagus beetle. Thin spindly shoots may be due to inadequate moisture, especially with young crowns. In established beds the cause is more likely to be overcropping or competition from weeds. Asparagus was first domesticated by the Greeks and then the Romans took the culture of growing asparagus from eastern nations, from which they also took the old Iranian word 'sparega', which means shoot, rod or spray, referring to the plants habit, becoming 'asparagos' and 'asparagus' in Greek and Latin respectively. The specific designation 'officinalis' indicates its inclusion in official listings of medicinal plants. Asparagus has its origins in Eastern Europe, Caucasus and Siberia. It is a large genus comprising of about 150 species of herbaceous perennials, tender woody shrubs and vines. Some of them are grown for their ornamental value (ie Asparagus plumosus, A. densiflorus, A. virgatus) or for their medicinal value (ie A racemosus, A. verticillatus, A. adscendens). The wild species A. acutifolius has cultural roots in Spain and Greece. The only species cultivated for is tender shoots is Asparagus officinalis. The asparagus of the past was rather tall and narrow, very similar in appearance to wild asparagus. The fat-stemmed types with which we are more familiar evolved in the eighteenth century. Yet for all the claims about their relative merits, there were only two basic types: green and white, based on the colour of the spears. The old dark green varieties were often tinged with red or violet on the bud end. It is out of these that the modern purple-stemmed varieties have been developed. One of the first detailed guides on how to raise asparagus is traced back to about 65 A.D. by the Roman Columella. Romans spread the culture of growing asparagus along with their empire throughout Europe. In all Europe, except Spain the decline of the Roman Empire brought a decline in its cultivation, which was confined only to some feudal lords and monastery gardens as a medicinal plant, until the Renaissance, when it was rediscovered as an appreciated vegetable. The Renaissance brought an increased interest in neglected species, the growing of asparagus became popular in the sixteenth and seventeenth centuries in Germany, France, England and the Netherlands. Asparagus populations began to be identified according to countries and towns where they were grown, arising proveniences as Riga, Ghent, Vendome and Violet Dutch. During the nineteenth century Argenteuil from France and Braunschweiger from Germany gained reputation, replacing populations and landraces currently planted by that time. Subsequent selections were conducted from Argenteuil in many countries, yielding Early and Late Argenteuil in France, Reading Giant in England and Palmetto in the USA. In the beginning of the 20th century, in France and Italy selections of advanced cultivars were derived from Argenteuil, while in the US, a great effort of breeding was carried out by JB Norton in the search for rust resistance (Puccinia asparagi) yielding Martha Washington and then Mary Washington cultivars. Each cultivar was the advanced first generation progeny of two selected plants derived from Reading Giant and probably Argenteuil. Mary Washington was hugely successful and is still available today. Ideally mid March to the end of June.